February 19, 2013 By Katie P.
I’m terrible with cursive writing. We only spent a couple weeks on it in elementary school, then moved on. My 8 year old self thought it was a complete waste of time. My least favorite part of genealogy is deciphering handwriting. For goodness sakes, why weren’t most vital records printed, neatly? Here are my current hang-ups. Margaret A Rostron was born September 1879 in Allegheny County, Pennsylvania. She’s my 2nd great-grandmother, grandmother to Charles Duncan. Margaret A Rostron’s parents were Annie Nora and James Rostron. 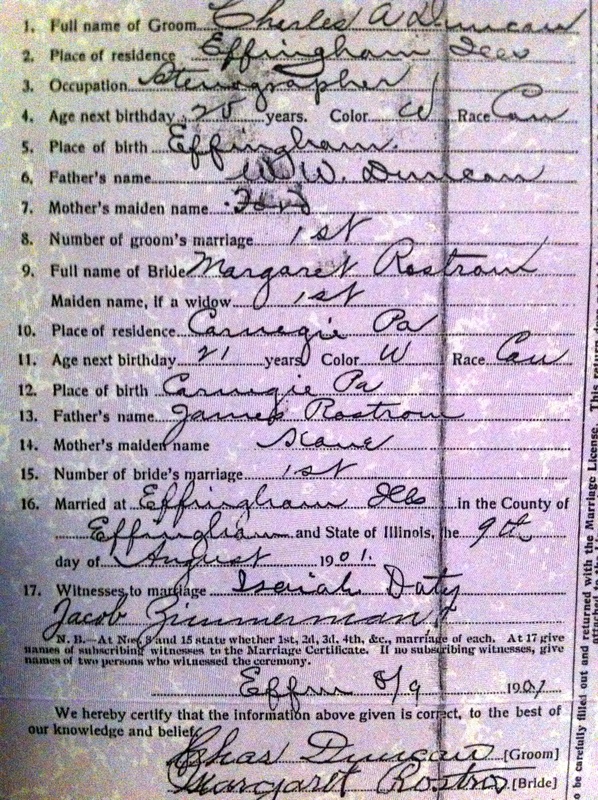 Margaret’s marriage certificate from 9 August 1901 gives both her parent’s names and her mother’s maiden name. But, her mother’s maiden is not so clear (to me at least). For the longest time, I thought her mother’s maiden was Slave, but it’s not very common and didn’t lead to anything. Her death certificate also lists her father as a Cain, but it’s the same informant on both certificates. My next mystery is from the death certificate of my 3rd Great Grandfather, William Murphy. Thanks to the Pennsylvania State Archives opening up death certificates to the public, I’ve had a ton of great breakthroughs. Everything on the death certificate matches up, his address, occupation, age (range). But I can’t figure out who the informant is. He passed away at the home of his daughter, Sarah Davis. He had two other daughters that I don’t know what happened to, so I’m curious if this is one of them. I’m also curious because Chester is on the other side of the state so this couldn’t be just a neighbor. It’s something like Mrs. Nod Hannon? I have no clue. I think it’s Mrs Wm Hannon, and the Wm stands for William. Did William Murphy have a daughter who married a William Hannon? I’m old enough to have been taught cursive writing at school here in England, but I still have trouble with it! But yes, the first record is Kane. The Kane and Cain spelling variation will be the result of the official filling in the forms being told the details and writing down what he heard, as phonetically they’re the same. Do you think it could be Mrs Wm Hannon?